Not only are the two temples at Abu Simbel among the most magnificent monuments in the world but their removal and reconstruction was an historic event in itself. When the temples (280 km from Aswan) were threatened by submersion in Lake Nasser, due to the construction of the High Dam, the Egyptian Government secured the support of UNESCO and launched a world wide appeal. During the salvage operation which began in 1964 and continued until 1968, the two temples were dismantled and raised over 60 meters up the sandstone cliff where they had been built more than 3,000 years before. Here they were reassembled, in the exact same relationship to each other and the sun, and covered with an artificial mountain. Most of the joins in the stone have now been filled by antiquity experts, but inside the temples it is still possible to see where the blocks were cut. You can also go inside the man made dome and see an exhibition of photographs showing the different stages of the massive removal project. 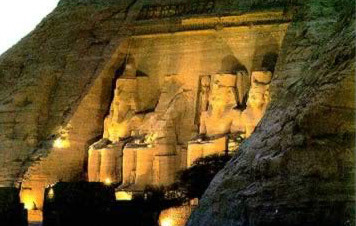 Abu Simbel was first reported by J. L. Burckhardt in 1813, when he came over the mountain and only saw the facade of the great temple as he was preparing to leave that area via the Nile. The two temples, that of Ramesses II primarily dedicated to Re-Harakhte, and that of his wife, Nefertari dedicated to Hathor, became a must see for Victorians visiting Egypt, even though it required a trip up the Nile, and often they were covered deeply in sand, as they were when Burckhardt found them.